SHARANYA KANVILKAR writes from Bombay: The priorities of the Indian media are in extreme sharp focus courtesy Press Council chairman Justice Markandey Katju, who told the world just what he thought of us: idiots and ignoramuses diverting the attention of the people by peddling filth and froth, and deliberately dividing the country on religious lines. Justice Katju’s “irresponsible” talk has been shot down by the chairman of the National Broadcasting Standards Authority, Justice J.S. Verma, who believes that it is time to shut down the press council as it has been ineffective in carrying out its mandate of protecting press freedom and maintaining/improving standards. It is clear that TV channels, news professionals and their “handlers” have been rattled by Justice Katju’s demand for an expansion of the press council’s powers to include electronic media. Which is why Justice Katju’s appointment soon after remitting office as a judge of the Supreme Court of India is being openly questioned. It is also clear someone’s watching—and waiting to strike. So, the Broadcast Editors’ Association has put out an “advisory” to TV news channels on how to cover—wait for it—Amitabh Bachchan‘s expected grandchild; the first child of his son Abhishek Bachchan and former Ms Universe, Aishwarya Rai. Obviously, these guidelines strike at the very root of Indian news television, as we have known it. So, will “your channel” follow these directives? Do you, the viewer, care if these guidelines are observed in the breach, or violated wholesale? And if it does, do you, the viewer, have the energy to write to the NBSA and lodge a complaint? 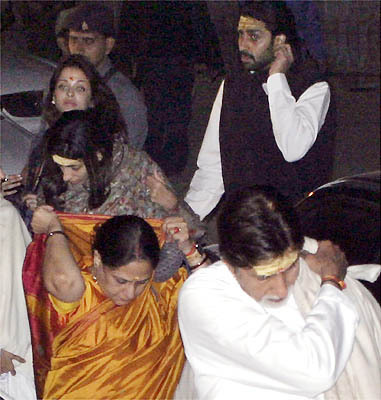 There is a media history to the Bachchans. Big B has had a mostly messy affair with the media. When he was in hospital, an Aaj Tak reporter (now with NDTV) barged into his room in nurse’s clothes. The Aishwarya-Abhishek wedding was covered in its minutest details. It was even alleged that Aishwarya had been married off to a tree to ward off a bad omen, etc. Will the latest AB baby have a flawless entry? And, speaking unsolicited for the baby, does it deserve such a meek, uncelebrated entry, given that the only thing that has sustained Abhishek’s and Aishwarya’s rather sad professional career has been the oxygen of manufactured publicity to the pop of the flashbulbs (when they are pushing some silly product)? This entry was posted in Issues and Ideas, Media, Music, Films, Television and tagged Aaj Tak, Abhishek Bachchan, Aishwarya Rai, Amar Singh, Amitabh Bachchan, Broadcast Editors Association, Churumuri, India TV, Indian Express, Justice Markandey Katju, Mumbai Mirror, National Broadcasting Standards Authority, NDTV, Prabhu Chawla, Sans Serif, Sharanya Kanvilkar. Bookmark the permalink. I laughed out loud on reading this. Are you serious?? Please don’t tarnish the image of one the most upright and brilliant Judges in the country over some Bachchans. Justice Katju has spent his entire life in the service of the country, while the Bachchans have leeched off it. On a side note, only Retd. Supreme Court Judges can be Chairman, PCI. Whats the issue with Katju getting it? Would the media have preferred someone else get it?? WHY?? Also, why embroil a good man in a controversy. Have you checked your facts? Isn’t this the third point J Katju raised..misrepresentation, lack-of research, twisting facts and sometimes outright falsifying information…!! At last the comments of the Justice Katju, has alerted the Electronic Media. Where as the issue has not touched the Regional channels. In the guise of covering of news of babes to be born on 11.11.11, various opinions of the Numerology V/s astrology of the babes to be born on 11.11.11,has been extensively discussed at prime time in Suvarna channel on 7.11.11. Again the status of the Aish baby figured in. Photos of her bulged belly covered by flower bouquet was telecast for more than a minutes. The issue was not necessary. Where as silk farmers of Karnataka are agitating for the support price for cocoons. What exactly the price has fallen is not elaborated. Instead, the agitation of the farmers, rastha roko agitation, filing of FIR on the Kannada activists who have supported the agitation was beamed. Why the price dropped and action needed was not reported. This is how the regional news channels are performing. Yup, the breaking news band is so sacrosanct, so holy, **so** meant only for really really ***important*** news. Hence don’t use it. Morons. And to think someone wasted time to think about and list down these guidelines. Who gives a damn about the Bachchan baby? I mean, all the best to the new-born, but does the whole country need to know anything at all about it? Shut down the electronic media please. this is hilarious. suvarna news has been going on and on for the past two hours about how they are not allowed to cover this herige. looks like it will continue well past the herige. We should call it “Water Breaking News” may be.